Nota bene, all you former Reggie students. At long last… after many delays… Fr. Reginald Foster’s Latin book is printed, released and shipping on 18 October! I’ve added it to my list. 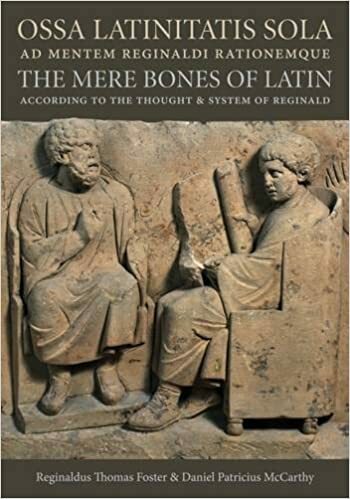 Ossa Latinitatis Sola ad Mentem Reginaldi Rationemque: The Mere Bones of Latin According to the Thought and System of Reginald by Reginaldus Thomas Foster – UK – Not yet. Finally, there will eventually be volumes of Foster’s famous (infamous?) homework sheets or Ludi Domestici. I still have lots of them squirreled away somewhere. Having them bound in volumes will be invaluable. For my original post about this go HERE. This entry was posted in The Campus Telephone Pole and tagged Fr. Reginald Foster, Latin. Bookmark the permalink. 15 Responses to Reginald Foster’s 1st Latin book FINALLY out! I ordered this over a year ago when you put it up. And just yesterday for the Amazon arrival notice for 19 Oct. Can’t wait. I noticed that one or two of the projected future volumes focus on Cicero’s letters. I can’t wait! Reggie is probably one of the world’s leading experts on the Latinity of Cicero’s letters. I remember his telling us that immersing oneself in Cicero’s letters would be a terrific way to learn a great deal about Latin. Just now, I preordered my copy. Thank you, Father Z, for the “heads up”! In an all-out bid for the sour grapes of the day award, first I want to point out that per Amazon they do NOT have it in stock, but it WILL be in stock on October 19. And so dem bones will ever recede into the future, like a ghost . . . .
Secondly, I cannot believe we are still studying this language from books. Lately I’ve taken up French and the free or almost free resources for studying French on line are incredible. For example, Anki has an electronic flash card deck of 10,000 SENTENCES in French WITH Audio, excellent audio. For Italian decks of 15,000 sentences are available. The largest comparable deck for Latin at Anki is one with 1788 phrases with no audio. Or, consider Fluencia, the online progam for studying Spanish—to die for. I’ll admit to not doing extensive research for the study of Latin online, but what I have been able to find is meager and clunky compared to what is available for other languages. In rhetorical effort to motivate us with irony, Fr. Z, you’ve occasionally referred to how HARD is the study of Latin and I understand the rhetoric, but it is hard and there is a lot which could be done to make it much easier. [Ummm… no. I don’t think so. Quite the opposite. I’ve often posted things about tiny children learning things in Latin. I’ve mentioned, as Fr. Foster did, that hookers and fishmongers spoke Latin in the streets of Rome. It’s a language. However, there is something about this language in particular that gives a special forma mentis.] And the easier it is made the more Catholics will study it, and the sooner will be our recovery of Latin as a living language and of our identity. We may not have the funds to come up with the Ecclesiastical Latin version of Fluencia, but Anki offers the possibility of a low-cost labor intensive effort to put together a deck ( or several) consisting of thousands of sentences with audio in ecclesiastical Latin. Do we really imagine that we are going to re-kindle the use of Latin by teaching our young intellectuals to discourse in Ciceronian periods? No, let’s do something else. I find it sad that the religious origins of this text mean that it will almost never be used at university level, such is the overall hostility to Christianity in the academy. The difference is that the hookers and fishmongers learned it as children by the process by which people acquire a native language. I’m trying but will never get to fishmonger fluency. Glad tidings! This has been sitting in my cart since 6/13/2015…I had sort of given up and now here it comes. I learned German by living in Germany for 4 years. Latin, like German (even more so) is a highly inflected language. But, unlike German, one reads it and not necessarily speaks it. My wife, who home schools our children, teaches Latin as a requirement (her requirement) as well as one other modern language. Her methodology is mainly recitation of prayers, as well as old chants. I don’t think any of our children enjoyed learning it. However, the young adults appreciate it now, whenever they come across a Latin saying or quip in a novel or cultural reference. I’m ordering the book for my own benefit. It’s been decades since I was forced to learn a foreign language, and I always looked at Latin as being some kind of gateway into the mysteries of antiquity. It’s been so long I forgot I even ordered it. So you want the exciting Latin, eh? How about Pliny the Younger’s letter about the eruption of Mount Vesuvius (&a the subsequent death of his uncle, who had a pre-existing asthmatic condition and couldn’t breath in the ash storm)? Or try Suetonius’ story about Nero murdering his mother, & the description of Seneca’s suicide (stop me if this was in Tacitus too). There is A LOT of peg turning Latin literature out there. Forgot to add that I ordered it this past Wednesday evening. It has finally arrived! Yay!